California is decarbonizing bus fleets, in a sweeping move. California regulators have committed the state to ending fossil fuel use for its roughly 12,000-strong transit bus fleet by 2040, another long-term commitment to reducing the state’s carbon emissions that’s already being driven by the economics of electrifying transit and school buses. Last week’s unanimous decision by the California Air Resources Board requires all newly purchased buses to be carbon-free by 2029, a classification that could include electric buses or hydrogen fuel cell-powered buses, and would phase out all diesel or natural-gas-powered buses by 2040. California has a long way to go to reach these goals. Today, only about 150 zero-emission buses are operating in the fleets of the state’s 200 public transit agencies, a tiny fraction of the estimated 386,000 electric buses deployed around the world — 99 percent of them in China. But cities and counties across the U.S. are beginning to commit to shift their entire fleets to battery-electric buses by a certain date, including Los Angeles County by 2030 and San Francisco by 2035 in California, according to a recent report by the Environmental and Energy Study Institute. School districts are also starting to make the switch to electric buses, with state support in place to help cover the higher upfront costs compared to diesel buses. The California Energy Commission, for example, has $94 million is available in the School Bus Replacement Program to swap diesel buses for electric models, with priority given to disadvantaged and low-income communities. 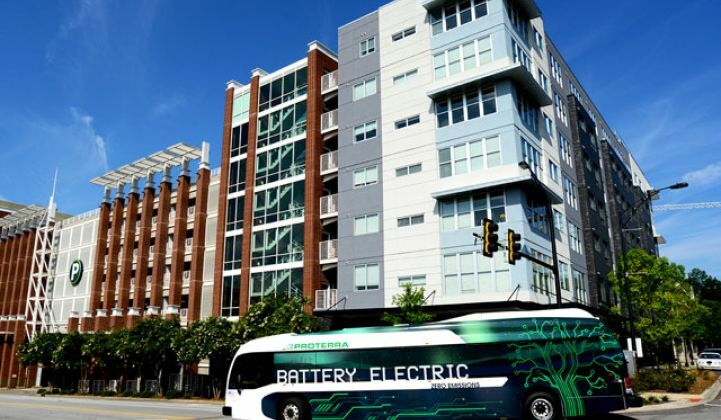 A recent report by the U.S. Public Interest Research Group Education Fund notes that electric transit buses cost roughly $200,000 more than diesel buses, but the lifetime fuel and maintenance savings of an electric transit bus amounts to around $400,000. Electric school buses cost roughly $120,000 more than their diesel counterparts, but can save $170,000 over their lifetime. The Clinton Global Initiative recently led a demonstration project, supported by the California Energy Commission, South Coast Air Quality Management District and NRG/EVgo, to deploy a total of six V2G-enabled school buses at three districts in California. The pilot found that each bus could generate $6,100 annually in V2G revenues. California’s investor-owned utilities are also investing heavily in the charging infrastructure to support the state’s EV policies, including electric bus and other heavier-duty charging systems. Pacific Gas & Electric and Southern California Edison have a combined budget of $592 million for their medium- and heavy-duty vehicle electrification programs, which include significant support for electric buses as well as trucks, forklifts, cranes and other heavy equipment. And San Diego Gas & Electric in November filed a $107 million proposal with the California Public Utilities Commission to deploy enough charging infrastructure to support 6,000 electric buses, trucks and other medium- and heavy-duty vehicles, as well as an electric school bus vehicle-to-grid pilot project that would charge up bus batteries when renewable energy is abundant and put it back on the grid when electricity is needed most. PG&E has also proposed to replace demand charges for customers that are using commercial EV charging with a new subscription rate plan, aimed at reducing customers’ exposure to the potentially cripplingly high extra charges imposed when their load exceeds a certain threshold. Outside of California, several states — including Vermont, Minnesota, Arizona and Michigan — are also dedicating a portion of their shares of the Volkswagen diesel emission scandal financial settlement to new school buses, with some establishing carve-outs for electric models. Michigan’s Volkswagen Settlement Beneficiary Mitigation Plan directs nearly $13 million toward school bus upgrades, with up to $3 million designated for electric buses and charging stations. It also covers 70 percent of the cost of a new electric bus and charging station, compared to 25 percent of a new diesel bus.